The CPK 7210N Alu flat solar collector, is a high quality and attractively designed modern product. It is engineered for domestic water heating systems, swimming pool heating and for central heating systems with the ability to store accumulated heat. The CPK 7210N flat collector is made of high quality materials, which give it a long life while operating under different atmospheric conditions. Use of a high quality surface coating and a single absorbing panel across the whole surface of the collector, provides the best possible heat transfer and the optimal usage of the absorbing surface. They are made of quality materials that allows them a long service life in all weather conditions. The aluminum plate is located across the entire surface of the collector to prevent air turbulence and therefore unnecessary energy losses. Due to a well thought-out flow system, the collector has only two upper 1 “connectors for connection. Proven installation system ensures easy, safe and high-quality installation in the shortest possible time. Using the latest laser welding technology, a copper tube matrix is integrated with a copper plate painted with the high efficiency heat gain material, which enhances the the thermic plate effect. The copper plate covers the entire surface of the collector, which helps prevent the creation of solar variability effects and any loss of energy. The upper transfer pipe is closed at its centre, which creates two passages for the heating conducting fluid that carries the heat energy through the collector. The collector casing is made of aluminium, dry tightened/calked and pressed without usage of silicones. 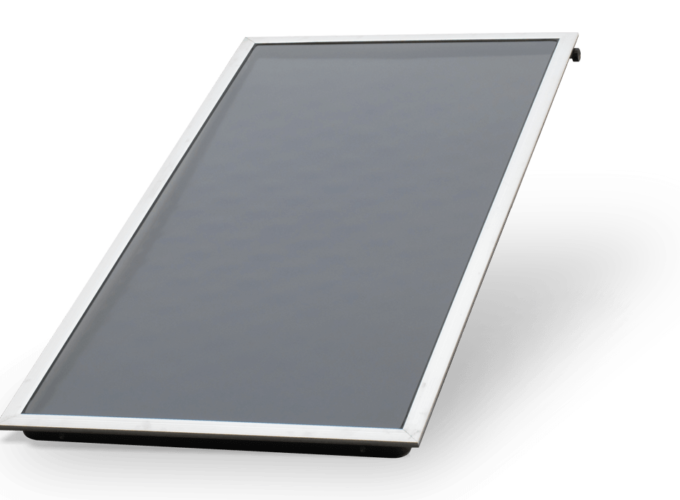 The 3.2 mm thick solar glass panel is sealed with a rubber ring joint. Thanks to an effective flow system the collector has only two upper 1” connections. Collectors are connected through a special union ring. Collectors can be either installed on the roof using the installation set (additional equipment) or free-standing on special carriers. The proven mounting systems provide easy, safe and reliable installation in minimum time. Collectors are designed for installation only in a vertical position. In one collector circuit can be connected maximum six flat collectors. 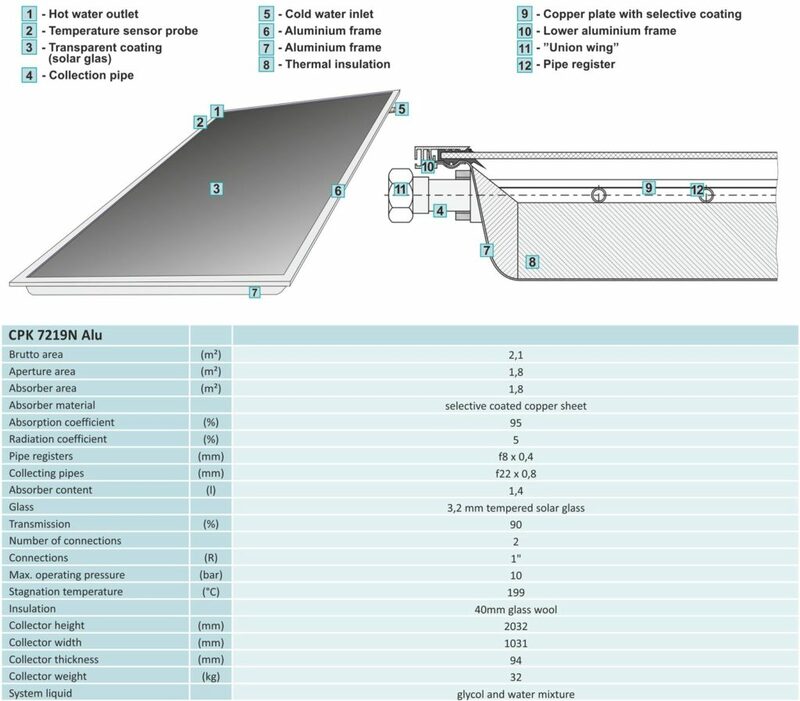 By integrating solar collectors into domestic water heating systems (STEB water heater), swimming pool water heating systems and central heating systems (CAS-S, -BS accumulation tank), use of conventional sources of energy can be reduced or avoided and, at the same time, environment pollution reduced.